Singapore was a fun, yet expensive getaway for us. This small city-state government is actually one that comes with a lot of warnings – they have some of the strictest laws in the world. No gum, spitting, jaywalking – and people actually follow the laws! This made Singapore a very clean city, but one that made us a bit nervous. We spend 5 days here and can see ourselves coming back. 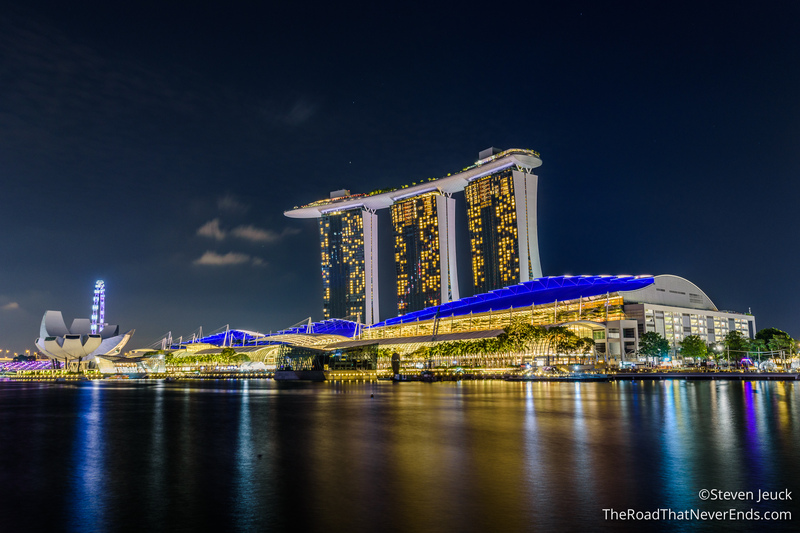 Singapore’s large airport hub makes it a great layover destination in South East Asia. We flew direct from Yogyakarta to Singapore via JetStar airlines. The Singapore airport is a massive hub to the rest of South East Asia, so flights to and from were cheap and easily obtained. Once we got to Singapore, we bought a Singapore 3-day Tourist Pass at the Terminal 2 MRT station. The pass was $30 SGD each ($21 USD) and allowed us unlimited transportation on MRT, light rail and bus. Once the 3 days were up, we were able to add money to the card and treat it like an e-card to travel on all Singapore mass transit. When we flew out 5 days later we returned the card and got all remaining funds on the card plus the $10 SGD ($7 USD) deposit back! The MRT is very cheap, most of our rides were less than $2 SGD ($1.50 USD), so we aren’t sure if we traveled enough to make it worthwhile. The card did provide discounts to local tourist attractions, which helped add value to the card. 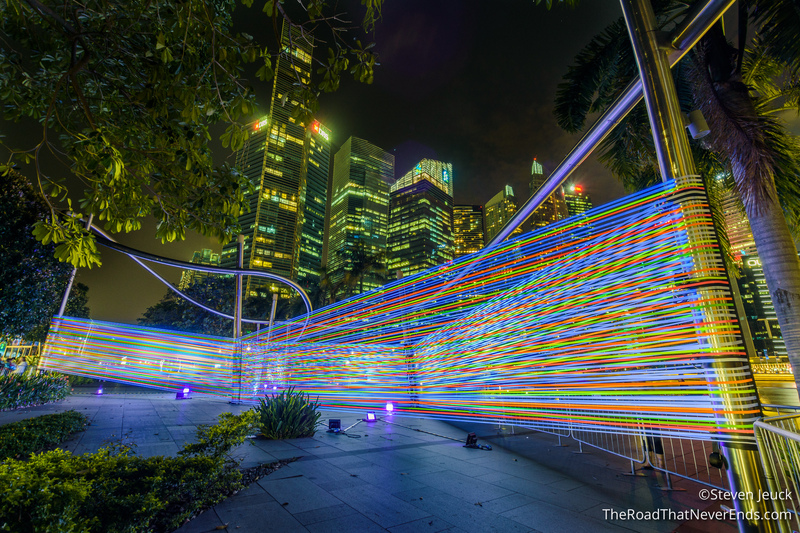 Singapore’s transportation system puts the US to shame. It is easy to use, very clean and full of great technology. Did you know it is illegal to eat on the MRT, and could result in a $500 fine, and it is heavily enforced. NO one ate on the bus, gum is illegal, so there were no gum stains. It was almost magical on how clean it was. We took MRT everywhere. We took the bus on a few occasions, and found that process to be pretty simple as well. The busses just have you to tag on and off with your card. All in all, if you end up in Singapore, take public transportation. It’s easy, cheap and better for the environment. 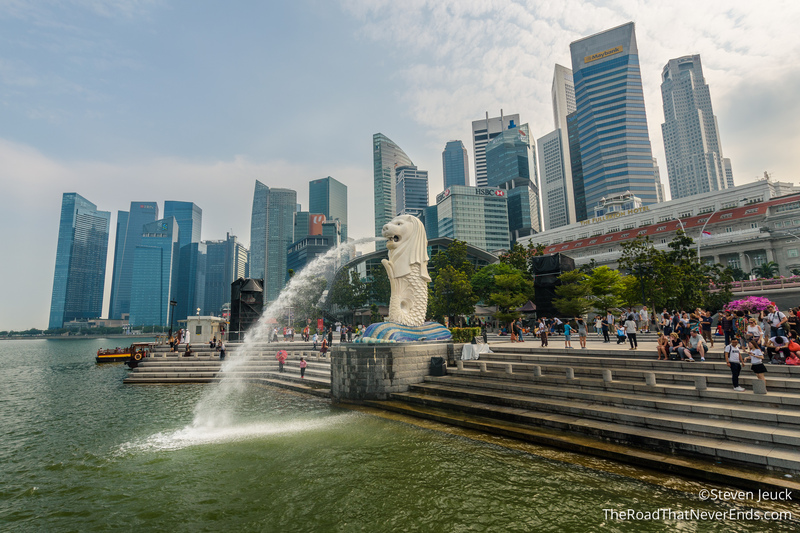 Singapore is the most expensive South East Asia country. It’s prices rival Sydney, NYC, and other high end cities. Picking a hotel/AirBnb proved challenging. After reading several reviews, and countless search time, we ended up staying at the Victoria Hotel. It was pricy for our budget, over $60 USD a night, but the location was everything. It was near two MRT stations, as well close to a Hawker for nearby food service. The hotel had two tiny twin beds, and not much walking room, the shower was itsy bitsy, but it was perfect for us. 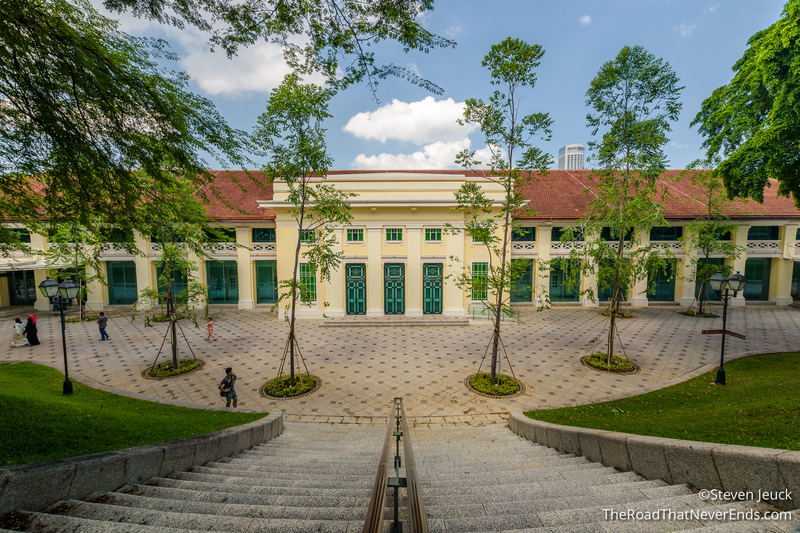 When looking at it, we felt we overpaid, but considering we were in Singapore, it was the cheapest one we could find with the right amenities and location. It is easy to spend a lot of money on food in Singapore. In fact, we treated ourselves to a Singapore Sling for a whopping $18 SGD ($14 USD)! 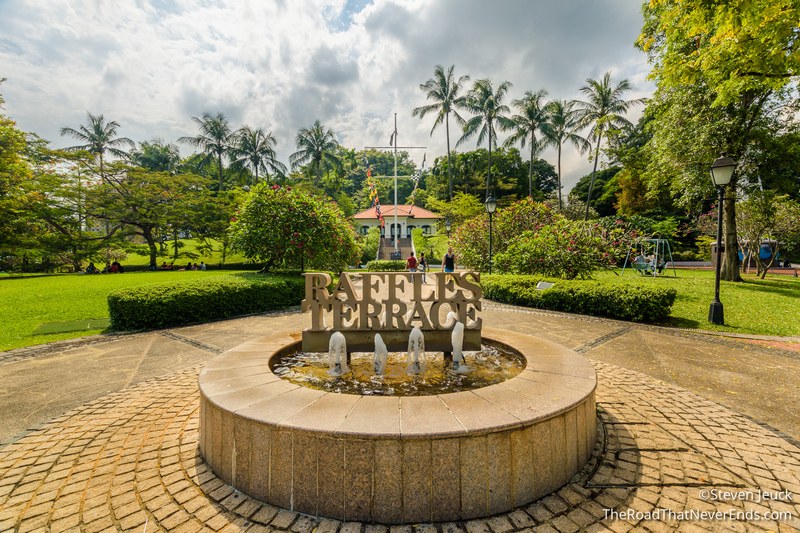 We had wanted to go to the place it was created, Raffles Hotel, however they were closed for renovation. Considering how expensive a drink is there, you might think the food must be extremely expensive – right you are, unless you eat at a hawker for every meal. Which we did. A hawker is like a food court, with various street food vendors selling food. The food was mostly Indian or Asian, but we did find one that sold Pizza and Western food. The average price of our hawker meal was less than $10 USD, with beer for the two of us. Not only was the price right, but the food was delicious. Our favorite food was in Chinatown where we spent quality time drinking with the locals (older Chinese men) and eating our body weight in dumplings. 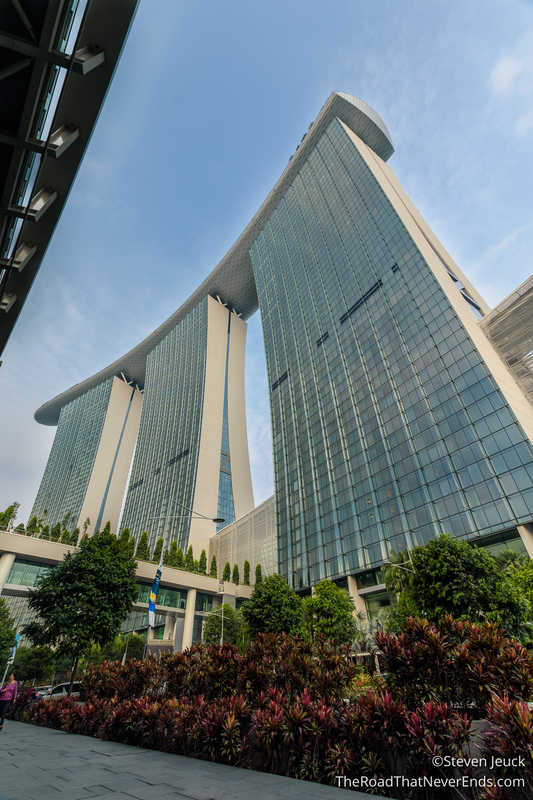 Marina Bay Sands Hotel, Casino, Mall – We didn’t stay at the hotel, or even eat there, but walking around the hotel and mall was impressive in itself. It made a beautiful statement piece in a lot of our photos. 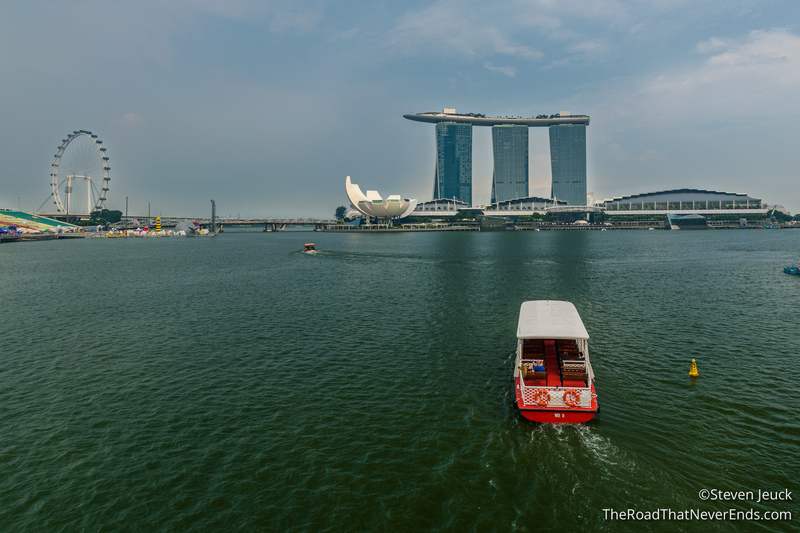 Marina Bay Water Front & Merlion – Walking around the waterfront, we had to visit the world famous Merlion, who we also found out is female. 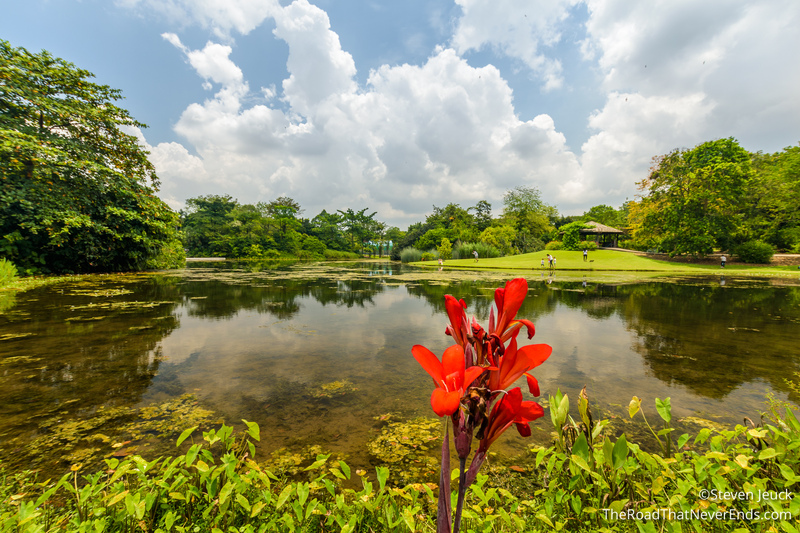 Botanic Gardens – The gardens are a UNESCO World Heritage Site and we can understand why. The park is massive, and could take all day to see it. Throughout our day there we were happy to see many birds, lizards and even turtles enjoying the surroundings. 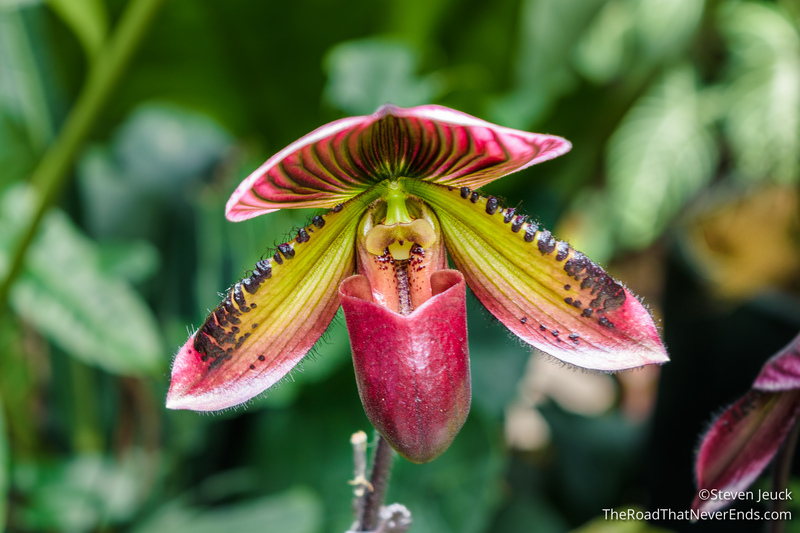 The main attraction for us was the Orchid gardens, which costs $5 to enter. We were delighted to see so many in bloom, and loved the cross breeding section, dedicated to many dignitaries who have visited the garden. 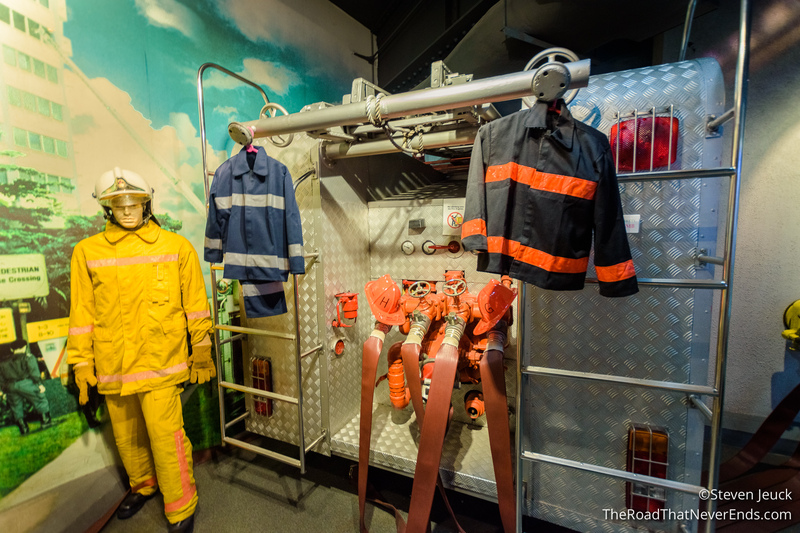 Civil Defense Museum – The central fire station of Singapore also serves as a museum for civil defense. It was a lot of fun checking out old fire trucks, playing in the interactive exhibits (I put out a fire! ), and reading about currently methods used to keep the city safe. 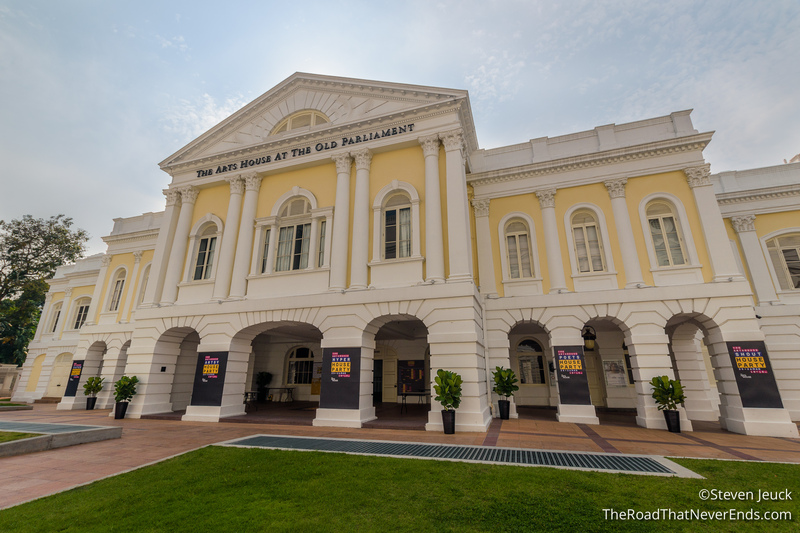 Old Parliament House – Now an art museum, this building once served as the Parliament house. We can’t resist a beautiful building. Battlebox – Steve and I were pretty excited to check this out. These were real life bunkers used during WWII. 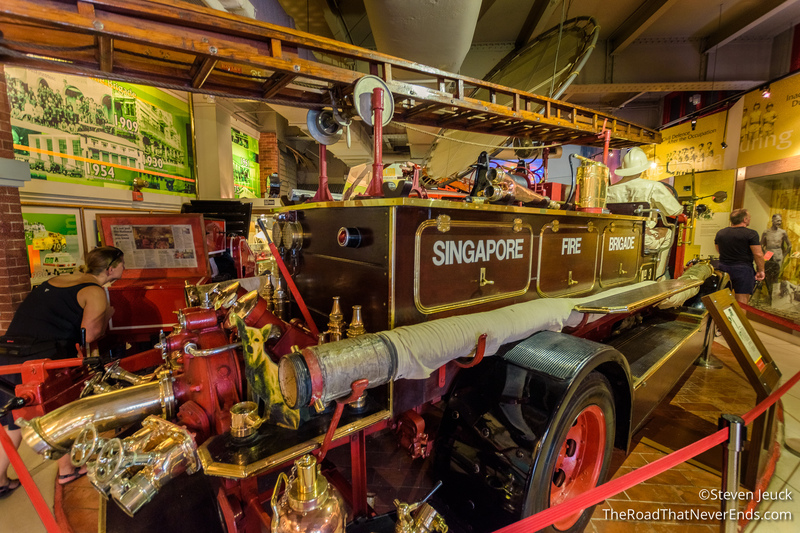 During the guided tour, we got to see the war through the perspective of Singapore, and it was fascinating. These underground bunkers were the command center for the Allied Command during the war. Singapore was then a British colony, and was not heavily protected. When Japanese forces came, British admirals made the decision to surrender, the largest surrender in British war history (the fall of Singapore) – over 80,000 soldiers. During this time, Singapore was under Japanese control and rule. 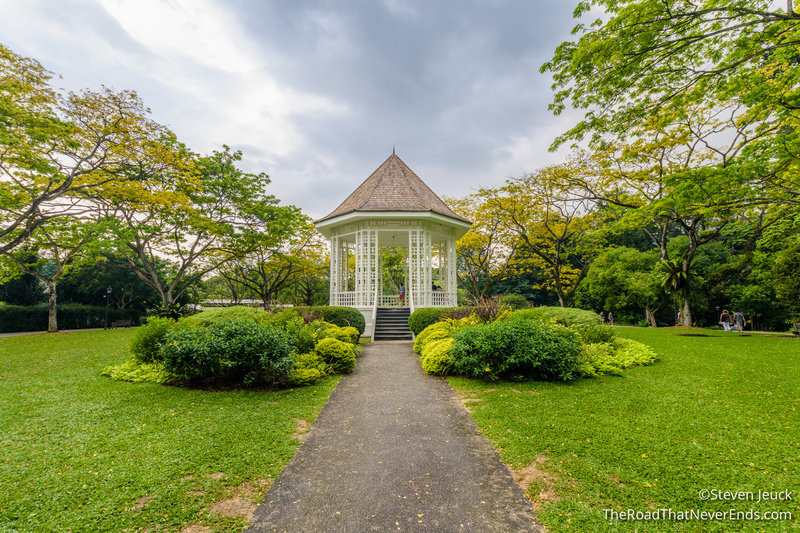 Fort Canning Park – Battlebox is located in Fort Canning park. 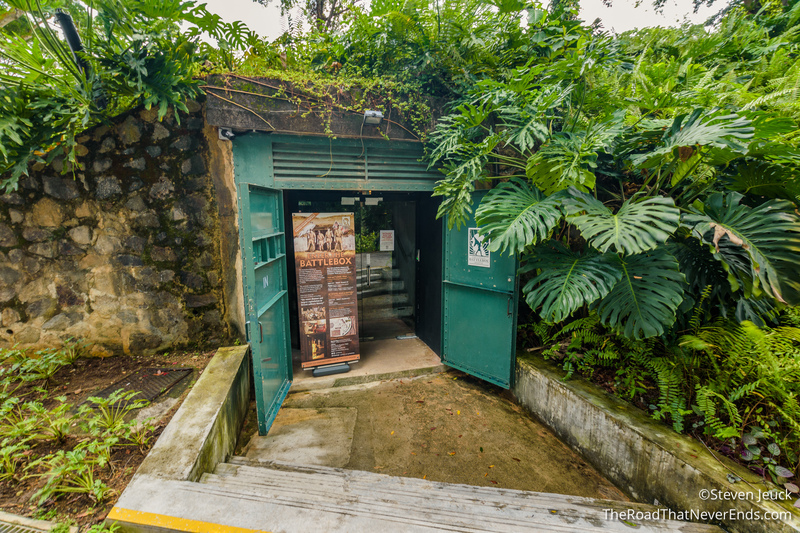 Fort Canning was built on the a large hill in Singapore, and served as a fort for many centuries for different groups. Today, the fort is now a park, with a hotel and art museum. 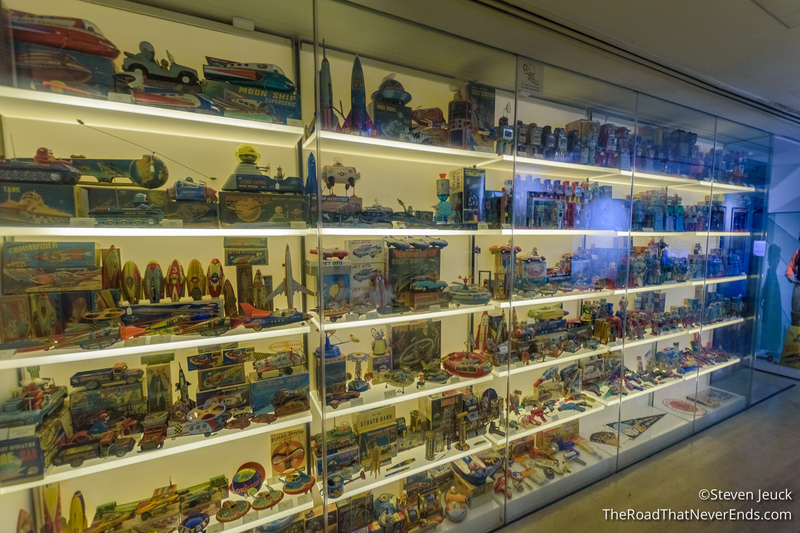 The Toy Museum – We only went here because we had free admission with our tourist pass. The museum, although small, had a lot in it. Neither Steve and I are big toy enthusiasts, but. It was fun going through memory lane and seeing toys we recognize. I would have to say that many toys were from the early to mid 1900s and were pretty cool. Normal price for this museum is $15, which we probably wouldn’t have paid. 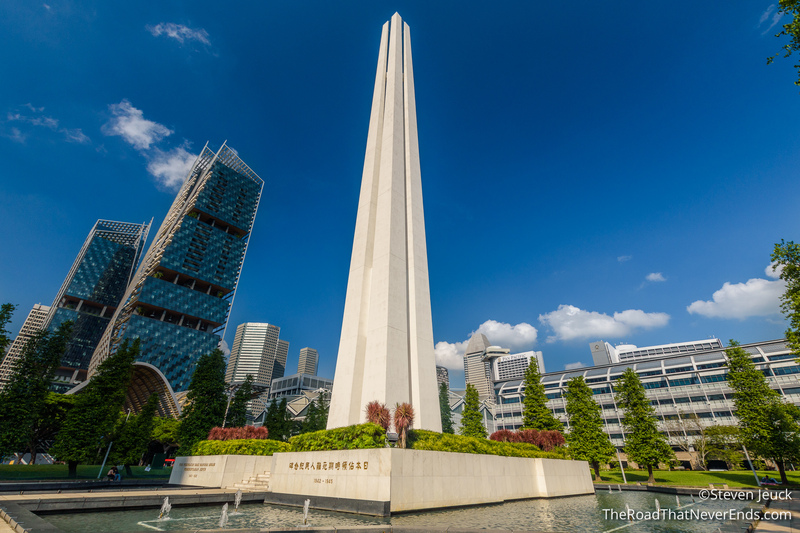 The Civilian War Memorial – This memorial was built to honor civilians killed during Japanese occupation. 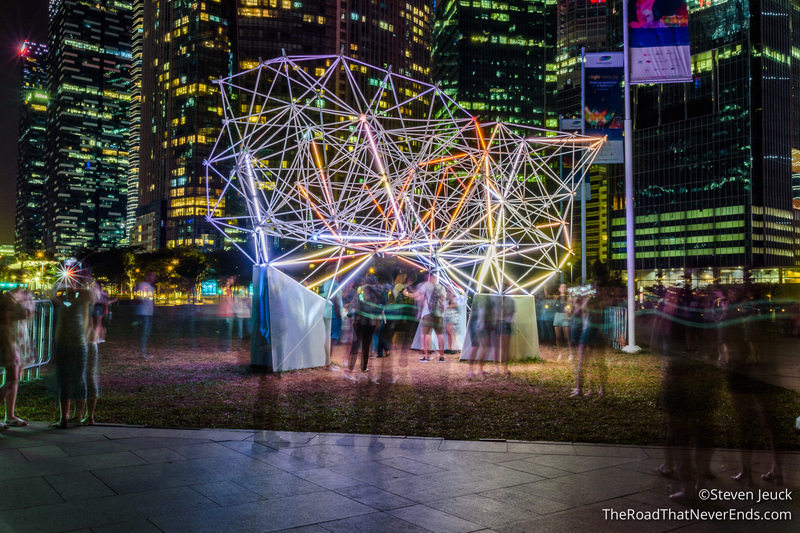 iLight Marina Bay – During our visit, the city had a spectacular light up show at night at Marina Bay. We actually went on the last night it was on display. It had over 20 light up features, a mini carnival, an inflatable zoo (for kids only), and several dance parties including a silent disco. We spend a few hours here wandering about checking out the art displays. 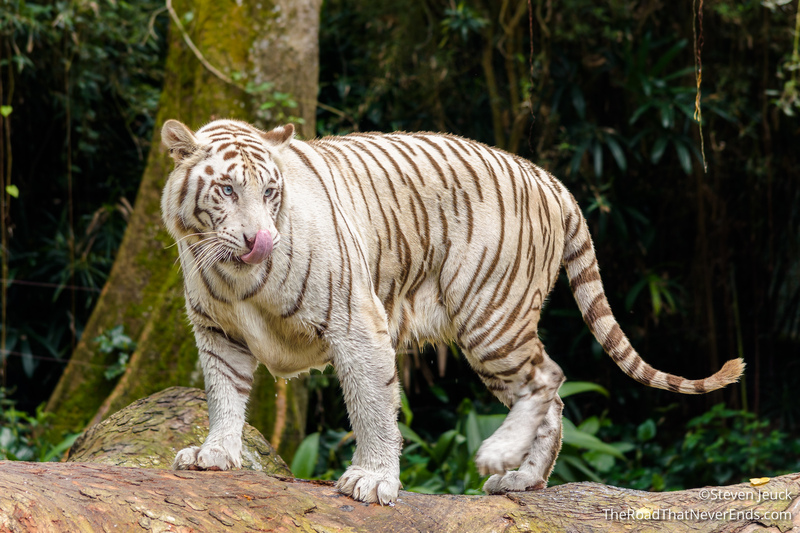 Singapore Zoo – My friend Annika had suggested we check this zoo out, as it is world renown. 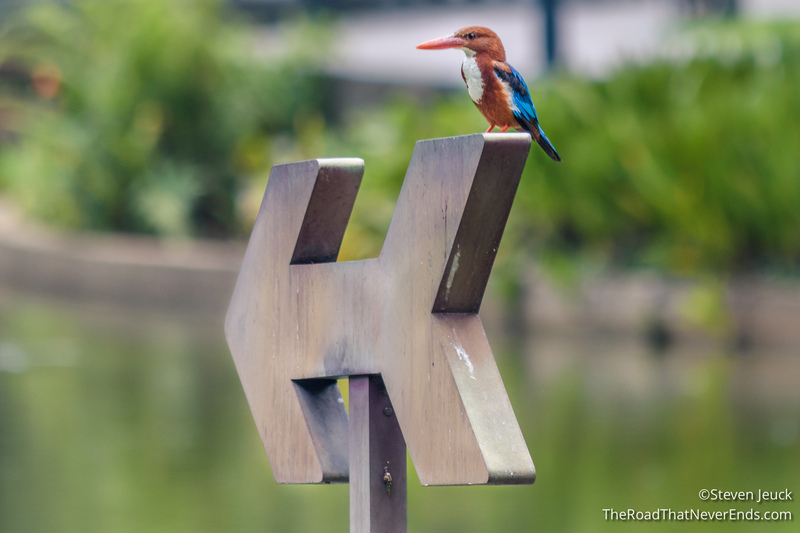 The zoo is actually made up of four parks: Zoo, Night Safari, Jurong Birdpark, and River Safari. 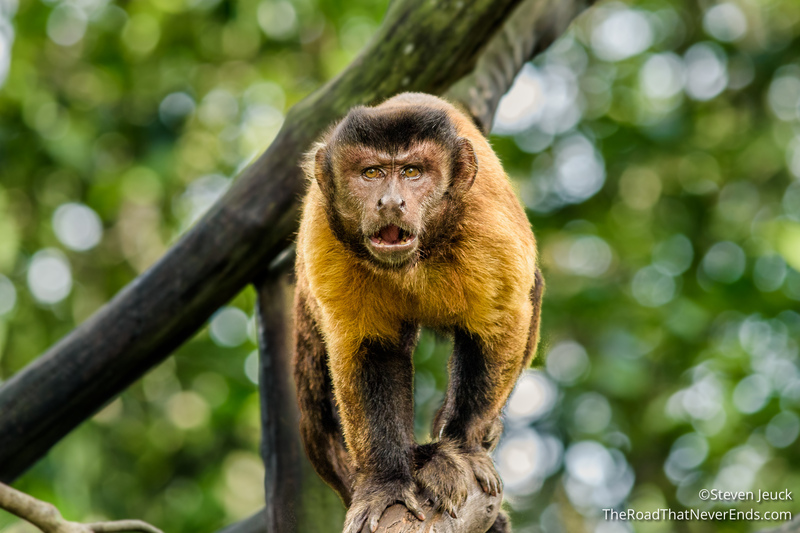 They are currently in process of moving the Bird park closer to the zoo, and the opening of a new Rainforest Safari – both scheduled to be opened by 2020. Steve and I could only dedicate one day to the zoo, so we bought a 2 pack – Zoo & Night Safari. If we return to Singapore, especially with children, we would consider doing a few days and tackling all the parks. The regular zoo was amazing. Upon walking in, we were greeted with monkeys who have free range of the area. We were surprised at how spacious the entire zoo is. It took us close to 6 hours to complete. One thing that impressed me about the zoo was how much education they try to relay to the customer. 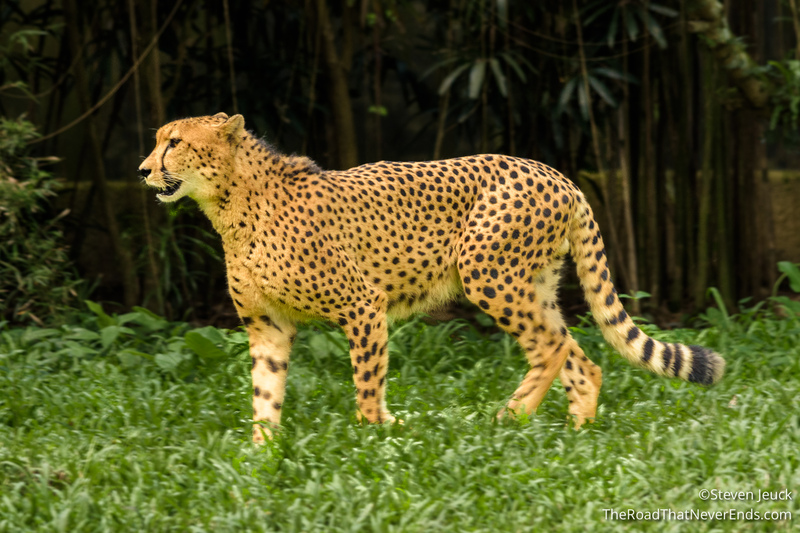 At every animal exhibit, there were facts about the animal, information about what threatens the animals, and a list of simple things you can do at home to help the animal. We learned how much the palm oil industry has really taken a toll on the environment and animals, how to be a more conscious buyer, and more. We were really impressed, and overall had a great day at the zoo. The only disappointment we encountered is, we didn’t get to see a sloth while visiting the rainforest section. We looked everywhere, but we assumed the sloth was in the “people free” zone, taking a nap. We didn’t watch any shows, so I really can’t speak to that. 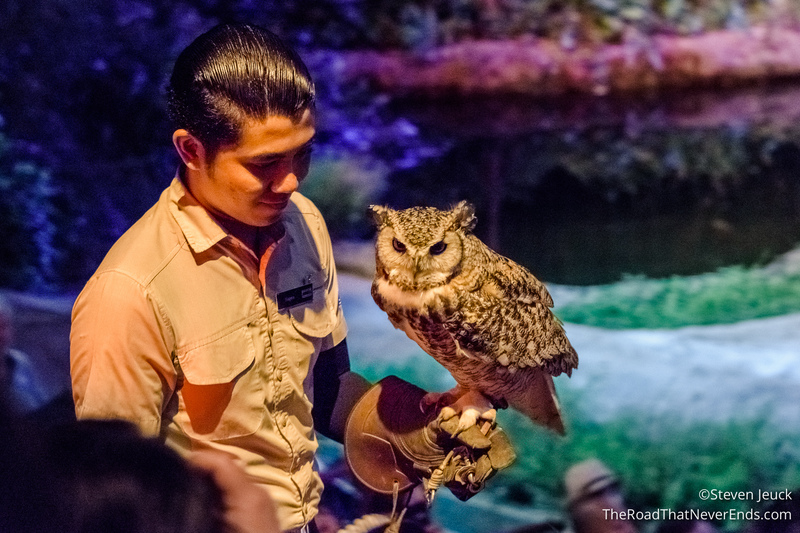 Night Safari – The name can be a bit deceiving, but nonetheless, it was a great evening. The park opens at 7:15PM and goes until midnight, offering customers the chance to see animals when they are most active – at night! We had read several blogs about the park and had high expectations. The park offers 3 main things: A walking trail, a tram ride, and a show. Everything we read said DO NOT GO TO THE TRAM first, and sure enough – the line for the tram was over 30 minutes long right at park opening. Instead we went to the show. The show was geared toward children, and in the end, we weren’t that impressed. We headed for the walking trails next, which took about an hour to complete. It was a lot of fun watching the felines at night, and even hearing the roar of a lion. 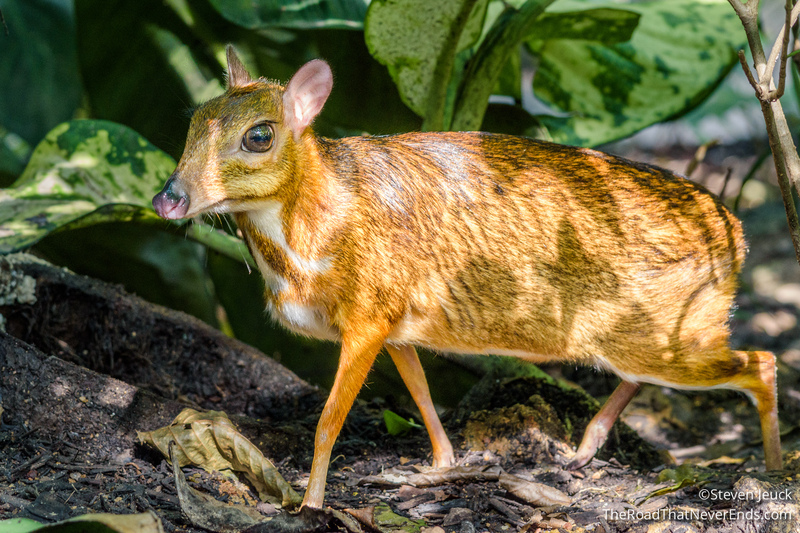 The zoo does not let you take flash photography, so we put the camera away and enjoyed the walk. The tram was the last experience for us, and it travels through areas you aren’t allowed to walk through including free roaming animals. It was very neat.